Anne: 'This post celebrates events in Nashville and includes this writer's observations, along with mini-stories from fans and students. What a trip! I will post in two sections. Part I will showcase Barry's visit to Middle Tennessee State University and Part II will recount the events at the Grand Ole Opry'. Arriving back at my hotel after watching Barry's appearance at MTSU, I posted photos and started writing, unable to sleep more than an hour or two. There's something about the reality of being up close and personal with someone you've been thinking about and singing with and admiring for most of your life. It just doesn't really sink into your consciousness that you actually were right there with him. It's kind of a fuzzy dream-like state that takes over your mind. Most fans have imagined what it would be like to actually talk with or "hang" with one of their personal idols. We all dream of what would happen. I've listened to every story one could imagine from "I want to run my fingers through his hair" to "I want to eat sushi with him". What? Where did that one come from? For me, an autograph or a concert isn't enough. I need a serious conversation; I have so many questions, and I've invested so much of my life in "Gibb dedication" that I long for that discussion. Well, that dream aside, I was in a dream-like state on Tuesday morning as I drove to my hotel to meet other Bee Gee fans who had come long distances for the Opry performance. Safely situated in Room 311, laptop on the desk, I called Debbi from Ft. Lauderdale, who had arrived earlier, and asked her to come up to make plans. Now here's another dream-like moment. Debbi walked into my room, we began to chat, and that feeling of "I've known you in another life" came over me. This scenario repeated itself throughout the day as I met other Bee Gee fans I had only known on Facebook. Bee Gee people share a common bond that the rest of the poor souls in the world are not privy to....the passion, dedication, obsession, whatever you want to call it, is deeply ingrained, and we all know that we can trust and feel safe around one another because no Bee Gee fan is uncool. Later in the day, Debbi and I met Holly, along with Amy and Connie and her husband from Illinois. Everyone I met on this day was a Barry devotee, speaking of him with great love. They had the music in common, the music which, I found out from many, helped them through cancer treatments, divorce, the death of a lover, and a myriad of life's challenges. I had to take a long, deep breath more than once as I felt the emotion in peoples' voices and saw it on their faces as well. Little miracles from the music. We had an early dinner and then headed to Opryland. The massive guitar outside of the theater is a favorite spot for taking photos, and many fans were gathering long before the show was to begin. Opryland is a fun place. The country music capitol of the world, Nashville is a friendly, positive city, and this particular theater has a long and revered history. Any performing artist today is honored to stand on its stage. Although we missed gathering with Heide, Alex and Laura, we knew they were inside of the theater with us. Seated to the left in the very front, I had close proximity to the stage, which was wonderful. I was wearing my "Children of the World" t-shirt, and got tapped on the shoulder by a fan seated behind me. Our conversation turned out to be one of my best stories ever. It was time to pull out the pencil and pad to listen to Gayle from Kansas City, Mo. recount to me her love of Barry Gibb. She was 10 when she first became a fan. She said "the second I heard his voice, I was a fan forever." Saturday Night Fever got her into dancing, and she took lessons at Arthur Murray Dance Studio. She was a young ticket agent for TWA airlines at the time, but told me that the Bee Gees "inspired me to quit TWA and dance for a living". She said, "Their music changed my life, and I've been teaching dance for 30 years." She made it clear that "no other artist has ever moved me like Barry. His lyrics mean so much". Gayle's dream now is to open a "dance bar" that plays Bee Gee music. Sitting behind Gayle were fans I had met at MTSU the night before, and I recognized many faces around me. Just before the show began, I glanced to my left to see Stephen Gibb standing there. I said hello, and got a smile and a handshake. Gibb men are special, no doubt. Now, the Opry show is unique, since it is broadcast live over the radio, complete with announcer (on stage right at podium), so there are breaks between performances and there are commercials. Normally several artists perform for each show. On this night, five artists were scheduled to sing before Barry, with Ricky Skaggs to follow Barry's performance. I could feel the momentum building as the other artists performed. The announcer would periodically welcome fans, who were from every corner of the country, including Oregon, Idaho and New York, as well as Canada. Montgomery Gentry took the stage right before Barry. They are two very popular men whose musical style is high energy and in-your-face-country passion. The audience cheered them, and they deserved it. Then there was a break, and one could feel the shift in the energy of the room, like little electric shocks running through the air. When Barry was introduced, the auditorium erupted in applause. Dressed all in black, Barry looked imposing. Now there's a difference between Barry Gibb performing and the rest of the world performing, and this is not a subjective opinion, just a fact. Everyone else was just a warm-up for the main event. By now, through the magic of social media, everyone on the planet can listen to the songs Barry performed. What they can't do is experience the feeling of being in the theater when he sang. "To Love Somebody" was just as strong, clear and passionate as ever. 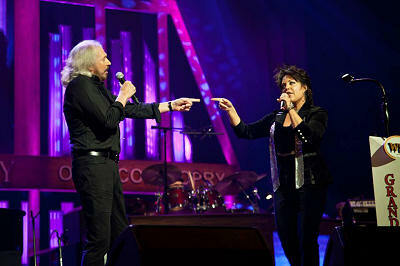 His duet with Kelly Lang, the sweetest girl in Nashville, was lovely. "Jive Talkin", with his back-up singers supporting him, had everyone jiggling in their seats. "Words" is just other-worldly, and no words can describe the aura of the theater as he sang it. It is a signature piece and sends waves of emotional energy through the fans' bodies and hearts. Of course he received standing ovations and the announcer was quick to tell the radio audience, "they're on their feet for Barry Gibb-a standing ovation" Barry waved a goodbye to the crowd and was gone. 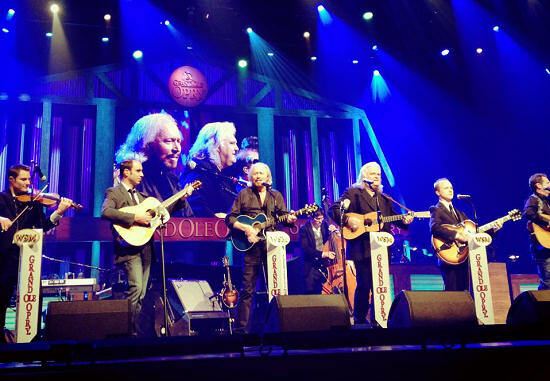 Knowing that Ricky Skaggs and his band were not about to let Barry go without performing with him, I was excited to hear what they would sing together. When Ricky took the stage, he made it clear to the audience that Barry needed to be part of the finale and Barry returned to the stage amid rapturous applause. The big surprise of the night was the song choice for the duet, "Stayin' Alive", the extended bluegrass version. This was a blockbuster performance; and when Barry hit the falsetto, the crowd screamed its appreciation and jumped to its feet. Barry, obviously gratified by the crowd's response, hugged his close friend multiple times, waved to the fans, and then the curtain came down. It was an emotion-filled performance....miraculous. Several fans met Barry when they took the pre-registered backstage tour after the concert. Luckily he was still there, and Amy told me she cried as she shook his hand. That's what it's all about: the man and the music that mattered the most for years and making a new memory of it. I spent weeks trying to figure out what tag phrase to put on my blog a year ago. I finally decided on "The Gibb Effect". 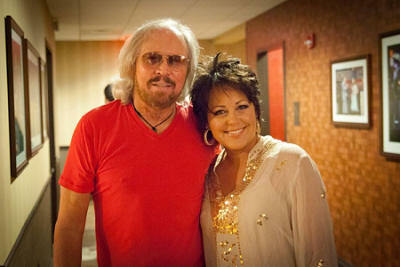 After witnessing two very different Barry Gibb performances, I thought about what Barry and his music had just done. He had changed young students' lives, opening up their eyes to his artistry and teaching them what great songwriting is about, he'd crossed genres, thrilling country music lovers and he'd reinforced long-time fans' special memories, giving them a new one to hold close in heart. Yes, he did it all alone. However, Bee Gee fans around the world know he's never in a solitary place. Robin and Maurice are ever a part of every performance. Destiny has led him to this place to carry on with the music, always spreading "The Gibb Effect". Barry Gibb and Ricky Skaggs performing Stayin' Alive, Bluegrass style.